Ron Howard, who produced (and directed the first episode of) the new National Geographic series Genius, about the life of Albert Einstein, has often turned to composer Hans Zimmer for his movie scores (including Frost / Nixon, Rush and the Da Vinci Code films). So it was a natural for him to ask Zimmer to write the theme for his new dramatic series (which, after Zimmer scores for such time-and-space-bending films as Inception and Interstellar, seems appropriate). Lorne Balfe, who has worked on most of the Zimmer/Howard projects as orchestrator or arranger, composed the scores for all 10 episodes, now airing. 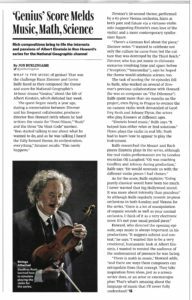 I interviewed all three of them for a story about the music — and coaching the actors in playing the violin, Einstein’s instrument of choice — in this week’s Variety. This entry was posted in Composers, Film Music, Interviews, Television Music and tagged Genius, Hans Zimmer, Lorne Balfe, National Geographic, Ron Howard, Variety, Zimmer science fiction scores on May 3, 2017 by Jon Burlingame.